The average download speed in mobile phone operator Tele2's 4G network was 45.68 megabits per second last year, according to the Public Utilities Commission's data writes LETA/BNS. The average download speed in Latvijas Mobilais Telefons' 4G network was 31.94 megabits per second, and in Bite Latvija's network - 28.37 megabits per second. In the 3G network, the highest download speed in Latvia was achieved by Bite Latvija - 9.97 megabits per second, followed by Latvijas Mobilais Telefons with 7.32 megabits per second and Tele2 with 6.7 megabits per second. According to the Public Utilities Commission's data, last year the 4G network of Tele2 covered 99.63% of Latvia's cities, Latvijas Mobilais Telefons' network coverage was 97.05 % and Bite Latvija's - 97.95%. 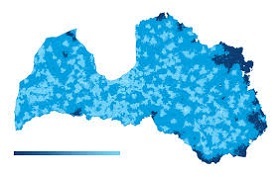 In rural areas, Tele2's 4G network coverage was 98.5%, followed by Latvijas Mobilais Telefons with 94.64% and Bite Latvija with 93.99% coverage.